Texas Instruments introduced at the 2011 T3 International Conference held on February 25-27 in San Antonio, TX with the TI-Nspire CX and TI-Nspire CX CAS their first graphing calculators with full color, backlit displays. The featured calculator is an early prototype of the TI-Nspire CX calculator and Texas Instruments asked us not to open the units. Please follow the links to the TI-Nspire COLOR and TI-Nspire CX EZ-Spot to peek inside these calculators. 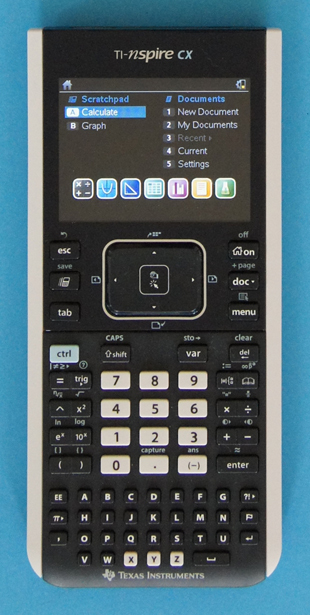 Since the TI-Nspire CX lacks a QWERTY keyboard it is permitted (as of March 10, 2011) for use on SAT, ACT, PSAT and AP exams.